Q. First of all, please tell us about your mission. We are going to conduct a variety of experiments in the space environment. New tasks during my stay include releasing small satellites and conducting experiments using killifish. I’ll tell you about the satellites first. The Japanese cargo transporter KOUNOTORI3, also known as the HTV3, will bring small satellites, 10 cm in diameter, and a release device to the ISS. 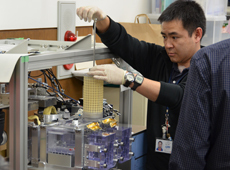 The satellite will be assembled in the Japanese Experiment Module Kibo, put outside through Kibo’s airlock, grabbed by Kibo’s robotic arm, aimed in the right direction, and released. In recent years, there is more and more demand for small-satellite launches. But despite its size, a small satellite is not something you can launch casually. To be launched alongside large satellites, the small ones need to meet the same strict requirements, such as being able to withstand the vibration on rockets. So the development of small satellites is relatively expensive. This time, however, the small satellites will be packed up and launched on the HTV3, so they won’t have to clear such strict requirements. Another advantage is that we can continue testing them on the ISS until we’re ready to insert them into orbit. And thanks to Kibo’s airlock and robotic arm, we won’t need to do a space walk to accomplish this. This method of launching small satellites may lead to the birth of a new business in the future. Now, moving on to the killifish experiments. The Aquatic Habitat, where the killifish will live in space, will be delivered to the ISS by the HTV3. The killifish themselves will come on a Russian Soyuz spacecraft during my stay on the ISS. By taking care of the killifish in space for an extended period, we will be able to study the impact of zero gravity on living organisms, particularly on their bones and muscles. The findings are expected to contribute to the prevention of osteoporosis and muscle weakness on the ground. Also, during my stay on the ISS, there will be two deliveries by the Russian cargo spacecraft Progress, one delivery by HTV3, and another by a U.S. commercial cargo spacecraft. Meanwhile, things we don’t need will be packed on the HTV3, which will separate from the ISS and burn up in the atmosphere. My other task is to do daily maintenance, such as cleaning the inside of the ISS and water recycling. Educational events are planned as well. Q. Is there anything you would like to do in your free time? I’d love to see the Japanese archipelago from the ISS. I couldn’t do it on my last flight because of the schedule. On my way back to Earth in the Space Shuttle, I was able to get a glimpse of part of the country - from the Tohoku region to the Noto Peninsula - but not western Japan, because it was covered by clouds. 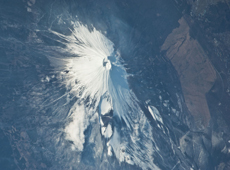 During my long-duration mission, I would like to fully enjoy the view of Japan. Q. Was there anything you struggled with the last time you were in orbit, and would like to master on the next mission? Last time, I didn’t have full control of my body when getting around on the ISS. For example, when I tried to travel with both my arms outstretched, as if I was flying… maybe I needed to relax more. I couldn’t fly straight and instead spun around and landed on my back or legs. Other crew members, who had already been on the ISS for a while, could fly fast and stop sharply wherever they wanted to. I would watch them with admiration. Next time, I would love to be able to move around freely, too (laughs). Q. What are you looking forward to most about the mission? 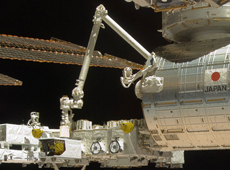 In 2008, I delivered and installed the Pressurized Module of the Kibo Japanese Experiment Module. I just did the installation, passed it on to the long-duration crew members, and returned to Earth, so I wasn’t involved in any experiments. Since then, I’ve really wanted to go back and work on the ISS. In that sense, I’m looking forward to every aspect of the mission. But, in particular, I’m looking forward to the arrival of HTV3 during my stay on the ISS. I have special feelings towards the HTV because in 2009 I supported the operation of HTV-1 on the ground as a communicator with the astronauts. Next time, I will be the one to meet the HTV in space. I get very excited when I think about it. Q. What kind of attitude do you hope to maintain during the mission? Through training and other opportunities, I’ve gotten to know my crewmates very well, so I think I will be able to spend time in space in a friendly atmosphere. However, being too busy can cause you to make mistakes, so it will be important always to remember to take care of each other. I’d like to enjoy the cooperative work, not only with my crewmates in orbit but also with the ground staff. The important thing is to enjoy every aspect, I think. Q. What is the highlight of the mission? I hope that the public will see the long-term value of our team’s efforts. As a project like this goes on, the novelty wears off and people lose interest, because there isn’t always something hot or newsworthy going on. However, when you put in a continuous effort, there are many things that you can learn. 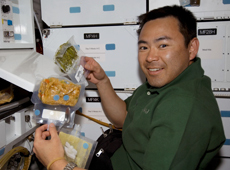 We are reaching the point where living in space, and having a Japanese person in space, is becoming normal. I think these are measures of our country’s achievement in the human space program. Last year, while astronaut Satoshi Furukawa was on his long-duration mission on the ISS, the total time spent in space by Japanese astronauts ranked third, after Russia and the United States. 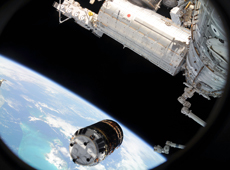 Also, Kibo has been operated from the Tsukuba Space Center for almost four years without any major problems. Over the course of the operation, there has been so much to learn, and thanks to the knowledge base we’ve built up, the operation has run so smoothly that it seems easy. 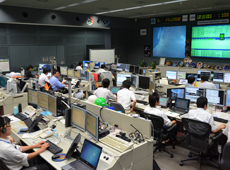 All of this is a result of Japan’s continued efforts in human space missions. Considering that, I believe that our duty as astronauts is to complete our daily assignments in orbit, and to inform the public about what we do. In orbit, we have meals and go to the bathroom, too. The ISS is a place where we live. I will be very happy if, by seeing our "regular life," people can feel closer to space. I believe that the time will come when many people start going to space. As someone who is going to space a little earlier to prepare the path for everyone else, I would like to show people that space is not that far away.